League form continues to be sporadic, picking up as many defeats as wins, we just cannot get a proper steady stream of victories together, teams have strengthened, as have we, the likes of Wolves, West Ham and Burnley are no longer guaranteed wins, they are up there fighting too. The cup competitions are this seasons saviour, where we have performed exceptionally well. You may remember from the previous post, that we overcome a very tense 2 legged aggregate victory over Man City to reach the Carabao Cup final against league leaders Wolves, with the bugged out scheduling pitting us away to Stoke City the day before the cup final, and also a league match against Wolves preceding the Stoke match. I decided to play a full strength squad against Wolves in the league, as a litmus test for the Cup final really, then field a second string side against Stoke the day before the Cup final, in order to rest as many first team players as possible. We beat Wolves 3-1 at home earlier in the season, and managed another 3-1 win this time round too, hopefully that’s a psychological block for them with the cup coming up. After going 1-0 up against the run of play, we finally succumbed 3-1 to Stoke, and except for a few late cameo’s, managed to get through the match without fielding too many Cup final starters or picking up any injuries. So there we have it, Cup winners with another comfortable victory over Wolves, I was very pleased with the result obviously, but more so the nature of the win, it was controlled, patient, and we showed good game management to see out the win and keep a clean sheet. It’s nice to get another trophy in the cabinet, the Carabao cup will sit alongside the EFL Championship trophy from a few seasons back, next port of call, to add either the FA Cup, or Europa League, or maybe even both. With only six matches left of season 7, as well as reaching the latter stages of the cups, I also need to pick up as many points as possible in the league to ensure European qualification of some sort, a Europa League win would put us in to the Champions League, which would be immense, but we need to navigate the tricky Valencia tie first then rely on a favorable draw, so much still to play for. Paul – well done on the cup, any cup is a win – the Benitez Doctrine of putting silverware in that cabinet is a good habit for any club, real or virtual, to get into. I watched all the highlights and have decided I really don’t like Martin Tyler as a footy game commentator. If I ever do take that PC-only route you keep urging me to take, and I end up FIFA-ing it (there’s a long summer coming up…), I’ll be modding Tyler out and Rae in. I find Tyler just so flat, not as flat as Smith but not far off. I’ve just seen Ladbrokes are offering generous 2/1 odds on you saying PES commentators are no better, or worse, but I haven’t listened to them since Brackley and Brooking. Derek Rae and Clive Tyldesley, now, I would listen to. Thanks NG – After getting to the semi’s last season, I was determined to win the Carabao Cup this year, the Man City semi-final was the toughest match, the final, as you saw was relatively straight forward. I don’t mind Tyler, his voice may be a bit bland but the intelligence of his commentary is very good and adds a lot to the game when he comes out with stats and details and actually mentions things that are happening in your live career mode. I don’t need to mention PES’s commentary, anyone with a basic hearing level knows its pure and utter gash of the gashiest order. Europa League games with Derek Rae and Lee Dixon are good, I don’t like Dixon at all but Rae reminds me of the old Tony Gubba PES games. Well done Paul. Wolves started brightly but they looked out of ideas in the 2nd half. Both goals were similar but 2nd was a better finish in my opinion. My favourite part is definitely the sliced shot at 1:25. I find myself saving more replays of terrible finishing just because it’s something not seen in PES. I’ve had a couple go out for throws recently. Commentary is ok in FIFA although Tyler and Smith seem slightly obsessed with West Brom in my game, I don’t care to hear about them every other match. Cook – I have so many replays saved of just random incidents that are so realistic, sliced shots, physicality, skills, saves, general passes of play, I will knock up a compilation one day im sure, but its always something new. I agree the second goal was nicer, a first time cushioned side foot placed goal into the corner, and from a defender! Congratulations Paul. Never an option to win the ‘lesser’ cup on pes. I think fifa’s commentary flaws are in the personnel – smith is not exactly ‘colour’ for me, too nasally whining, Tyler is pompous. Pes’s are script issues – the same stock, non-contextual phrase over and over. I would at least have fifa’s on, pes gets drowned out by real life commentary. Turf – its classed as the ‘lesser’ cup in stature but still has all the same teams in it, to win it i had to beat Liverpool, Cardiff, Man City and Arsenal along the way. PES’s commentary is just white dogshit, its embarrassing more than anything, a combo of Japanglish, crap scripts, completely irrelevant lines vs whats happening on screen and awful non-passionate delivery!!! I’d rather have a constant high pitched sine noise playing at 100db that PES commentary. Yes, as I said, congratulations on your lesser cup…. A cup is a cup is a trophy Turf and guess what?!? There’s an ACTUAL trophy and everything. Paul – well done mate (smiley with clapping hands) and that is your building block as it was the first trophy I won and went on from strength to strength after that. Cheers Darryl. Felt good winning something. 6 games left this season and still in with a chance in the other 2 cups. 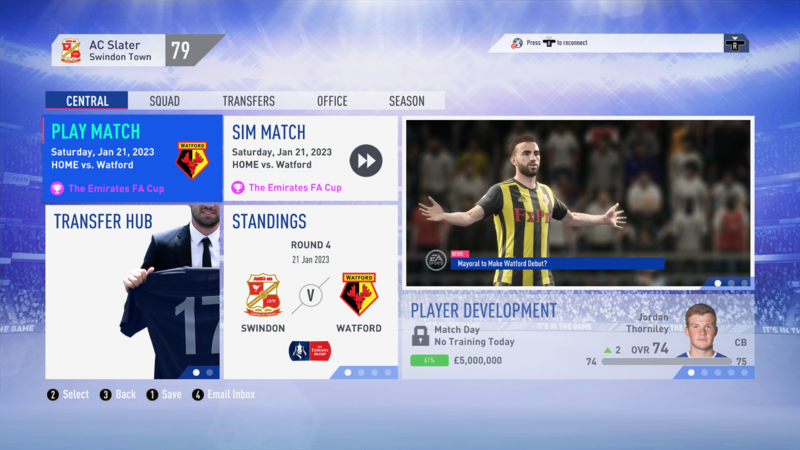 Here’s the two games in one day bug, I had Watford in the cup and Forest in the league. Not fixed, 4 months after release. It’s annoyed me this season especially because I need the points in the league to get autos. Then another game 3 days later with the whole squad having just played so that’s 3 games compromised as a result. I’ve never ever seen that cook. In 8 seasons I’ve never had 2 games on one day. Have you updated to the latest game patch ? It’s a known issue on the forums. 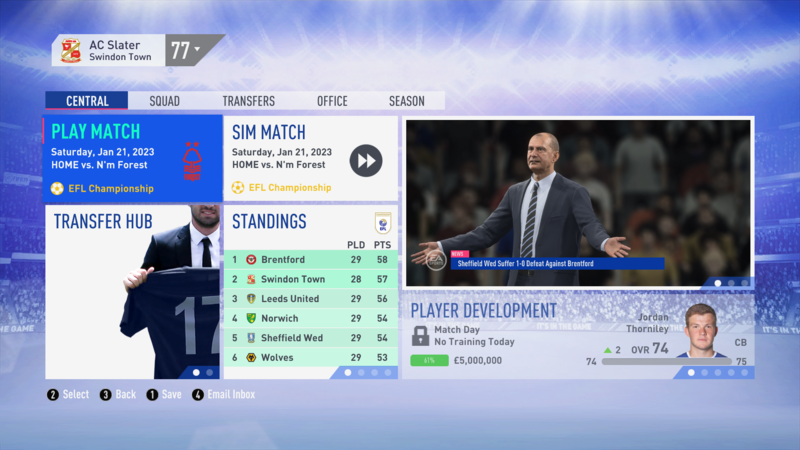 EA cannot seem to fix match scheduling for some reason. Well, I’m sure they could if they gave a monkey’s about Career Mode. Still enjoying it but these details should be easy to iron out. Cook – I didn’t experience the same day bug but had an occasion where the last league game of the season was followed by the cup final the next day. Whatever, it is piss poor and should not be happening when you consider how many patches have been out and they know about it. The priority of course is always on-line game balancing. That’s been fixed Darryl. In the latest patch. Have never seen 2 games on same day. Ever. Thanks Abbeyhill. That’s one thing FIFA allows you to do well …. counter attacks. Not all the time. But when the opportunity arises, plying the ball correctly to open up the team to the counter, you can pull off some sweeping moves. I’ll check that out thanks.